The window, an aperture in the mount, is usually cut with a bevelled edge. The glass is on one side of the aperture and the artwork is on the other, creating an air gap the thickness of the mountboard. The window-mount in this image is 3.4mm thick. Because it covers the edges of the artwork, a window mount can be useful for cropping or levelling an image. 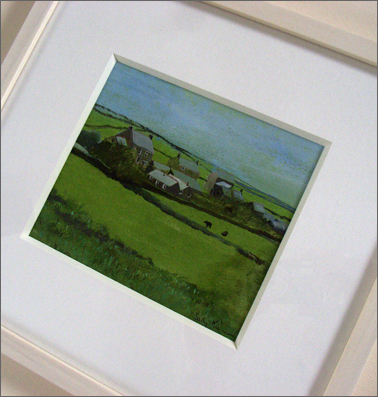 This style of frame is used to display water-colours, photographs, prints, etc. 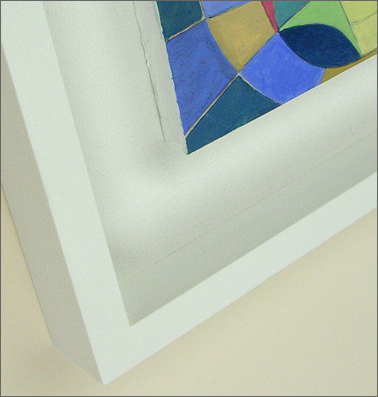 Box frames use a spacer or fillet between the glass and the mountboard to create a void large enough to hang the art without it touching the glass. With float mounting, the artwork is kept in front of the mountboard so it is entirely visible. This is most effective when the edges of the paper need to be seen, such as the deckled edges of this work by Lisa Wright. 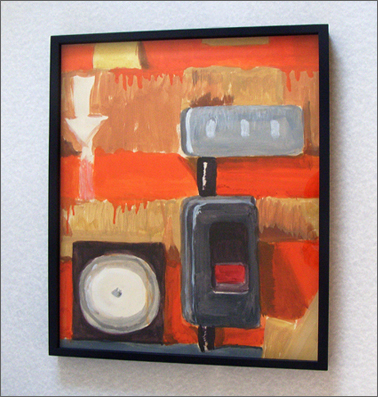 For distance-float mounting, there is another spacer behind the artwork, keeping it away from the mountboard. We set it back from the edges of the artwork far enough not to be seen, creating the effect of floating in space and adding definition to the paper medium. 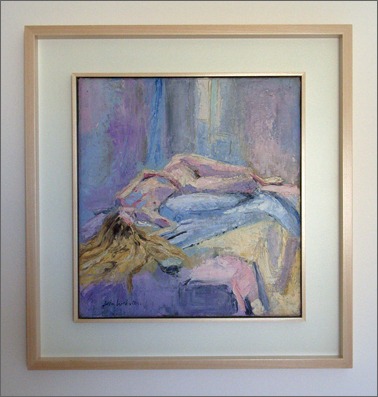 Close mounting is a way of displaying an artwork with no visible mount. The artwork is first taped to a piece of mountboard of the same size, before being placed into a frame directly up against the spacers. This method can be used to frame works on canvas or on board. It can also be modified for glazing. The edges of the artwork should be neatly finished, and are best painted to the same colour as the mounting board. 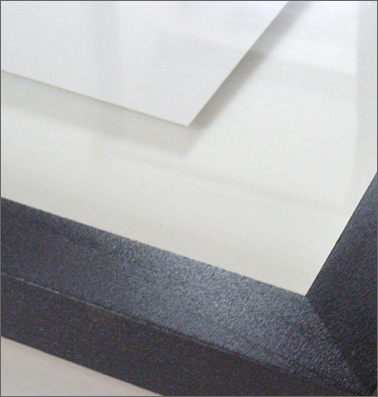 The frame featured in this image is painted to the same colour as the mounting board, but the tray format gives the option of using a different finish for each. 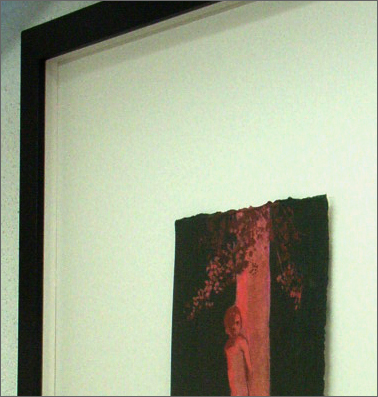 This method of framing can be used to equal effect for presenting works on canvas or on board. A dark outline is often used to give depth to an image. Here it is created by the gap between the edge of the artwork and the inner edge of the frame. The gap is kept small so that it fills with shadow. We make these frames in a choice of hardwoods and to any thickness, starting at about 7mm. This method of framing is most often used for canvasses, but can be adapted for paintings on board. It can also be modified for glazing. 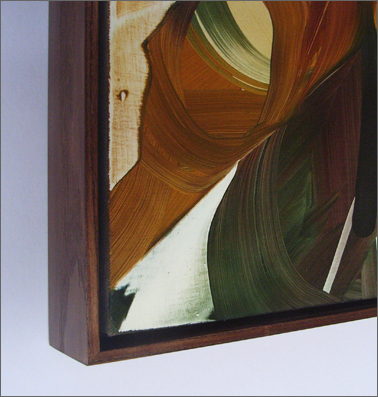 To give a positive balance to the many "cool" colour tones used on this canvas, we matched the paint on the mounting board to the colour of the sun-light, and used lime wood for both the inner & outer frames, sprayed with a clear satin lacquer, to bring forward the warmer tones in the painting. Art is not always displayed within conventional frames. 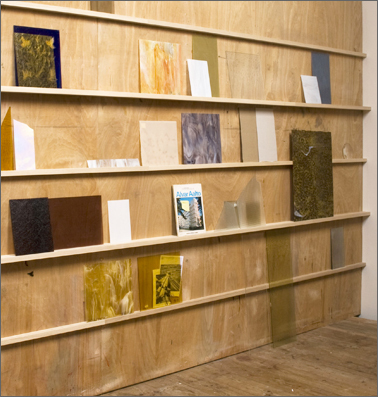 Here, for example, multiple works are being supported by battens. The wider battens have two grooves, facilitating a choice of incline for the art-panels and allowing larger pieces to rest above the height of the next batten. We designed this battening with concealed fittings so as to avoid unsightly screw-heads where it is fixed to the wall. If you have an unconventional or challenging brief, please contact us, we will be pleased to help you! Click on the thumbnails to change the featured style. See more variations of these styles on our gallery page.